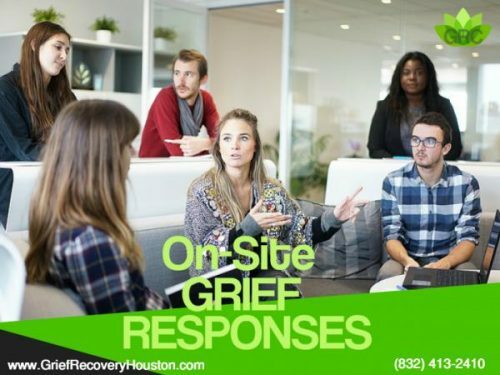 As the 2019 year comes to its 1st quarter, Grief Recovery Center continues to increase its efforts in Grief Education for the workplace, showing the benefits of On-Site Counseling in Houston, Tx. Grief Recovery Center has actively grown it’s critical incident onsite services this year for the Greater Houston Area. 2018 really showcased a growing need that has been greatly under-served in the community, with many companies having dealt with employee grief but not always not knowing where or how to address helping employees recover from trauma, even with the Employee Assisted Programs that are in place. Workplaces affected by natural or unnatural disasters, thefts, unfortunate incidents, fatality, or threat of life, for example, will experience a disruption that if left untreated can trigger repressed recovery for the employee, their family, and even the company itself. While it is common for such responses to occur, it sometimes can become very difficult to find the pathway to healing and well-being. GRC states “Providing compassion and education to grieving employees is what makes the difference between a good workplace and a great workplace.” Many factors may come into play in terms of how to keep and cultivate a healthy work environment. Presenting employees with the opportunity to express, deal with, or even just sit in a group and hear others acknowledge their feelings can go a long way in helping them cope and heal from any number of experiences. If you or your company representatives in Human Resources, for example, are interested in more information about Grief Recovery Center’s on-site grief counseling, please email or call, Monday through Friday, 8 AM – 5 PM CST, Saturday 9 AM – 4 PM CST.